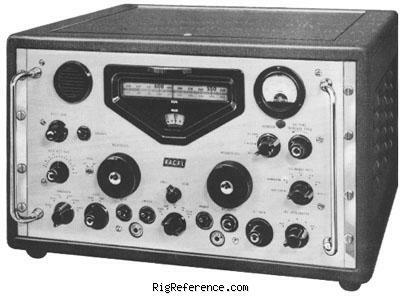 The Communications Receiver Type RA.117 has been designed for use as a general purpose receiver which will provide a high order of selectivity and stability. The receiver covers a frequency range from 1.0 to 30.0 Mc/s. The receiver is designed for both bench (table) and rack mounting. The front panel is painted Light Battleship Grey (British Standard Specifcation 381C, colour 697) and has been carefully designed to minimize operator fatigue. The chassis and major modules are of cast construction thus ensuring maximum rigidity and effective electrical screening. Each receiver is supplied with three keys to facilitate removal of the control knobs, insulated trimming tool and coaxial terminations for aerial and I.F. connections. Extra sleeves can be provided with the terminations for alternative coaxial cable sizes. The RA.117 is basically an upgraded RA-17L. Afterwarm-up, overall drift is less than 50 c/s per hour under conditions of constant supply voltage and ambient temperature. A1 reception, bandwidth 3 Kc/s; 1µV for 18dB signal-to-noise ratio. A2 reception, 30% modulated, bandwidth 3 Kc/s; 3µV for 18dB signal-to-noise ratio. 100-125V and 200-250V, 45-65 c/s. Estimating the value of a rig can be challenging. We collect prices paid by real hams over the years to help you estimate the current value of the Racal RA-117. Just bought or sold this model? Let us know what you traded it for and help other ham operators!